That is, in what places do the most inventors live? Let’s define an inventor as someone who gets their name on a patent. Let’s restrict it further to names on US patents, since the US system is much the largest – it gets twice the filings of the EU Intellectual Property Office. It so happens that Google keeps an XML database of all US patents here , although they’ve deprecated their search tools. I downloaded all 32 GB of the files for the year 2014 and boiled it down into this spreadsheet. In 2014 there were 301,643 US utility patents issued. There’ve been about 9M issued total, so it’s growing fast. I didn’t count design patents because they’re largely ornamental. There were 831,131 names listed as inventors, representing 537,662 individuals, where an individual is identified by last name, first name, city, state, and country. People who moved or happened to have the same name as someone else in their town would not get counted correctly. Rather than counting names on patents, I counted individuals, although one person may have gotten many patents in a year. There’s a rather sad story about that which I’ll tell in a later post. Not too surprising – these are the leading technical countries of the world. The US is larger than it probably should be because this is its own system. The UK and France are farther down than I would have expected given their scientific prowess, and Taiwan is farther up. Patents have been issued to 155 countries all told. They’ve gone to inventors in a lot of places you wouldn’t expect: Cuba has 154, Iran 62, North Korea 32, Afghanistan 3, Syria 2, and Greenland 1. Even tiny Monaco has 19 inventors even though they only have 36K residents. 94 countries and territories had no inventors, of which the largest was Sudan (pop 38M), followed closely by Iraq (pop 37M). Places torn up by war tend to not be good places for patent lawyers. There were also no inventors in Haiti, Laos, Bhutan, and El Salvador (too poor), or in Fiji (too beautiful), or in Antarctica (since no one is actually a citizen), or in the Vatican, although I’m sure the Jesuits would file a lot if they were allowed to. These are all the countries that beat the world average of 0.07 inventors per 1000. The most inventive countries are in developed Asia, North America, and northern Europe, with Israel as an outlier. This is again unsurprising. The top countries are largely those whose main resource is educated people. They invent because they must in order to be globally competitive. The exceptions to that rule are the US, Sweden, and Canada, which do have lots of natural resources. They also have lots of talented people, though, and so prove the rule. Perhaps a better rule is that countries with strong democratic values are friendly to invention. The least democratic state here is probably Singapore, and it still has a parliament, even though one party has always won. The most democratic country that isn’t here is probably Spain. California rules! 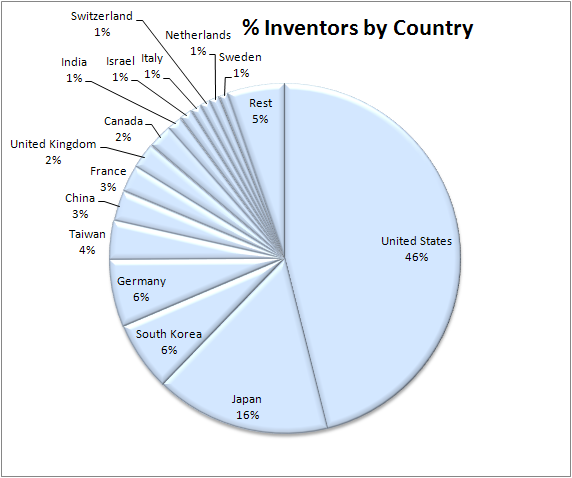 If it were its own country, it would be second only to the US and Japan in number of inventors. Texas does well too – it has more inventors than all of China. Note, though, that it’s the only red state in the top 10. 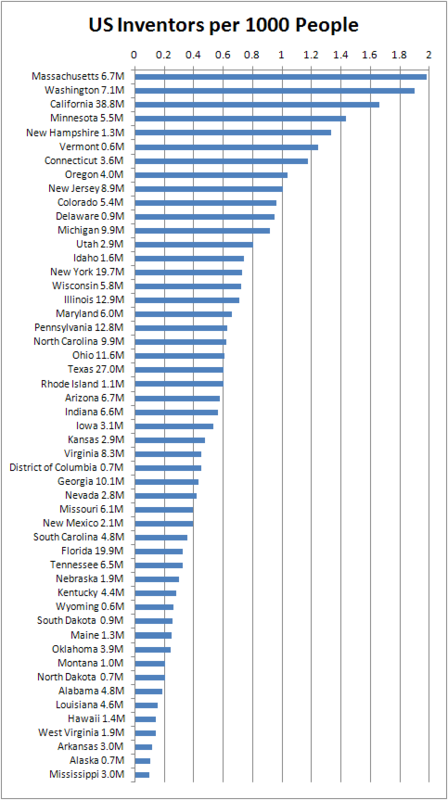 Sorry about that blur of names at the top – a lot of states just have very small proportions of the total. 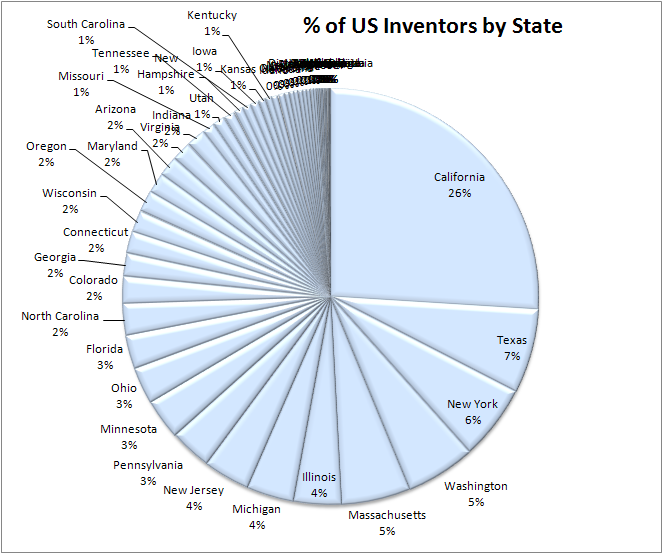 However, there are inventors in every single US state, and even 2 in Guam. There aren’t any in Samoa or the Northern Marianas, though. In the states of Massachusetts and Washington, about 1 in 500 people received a patent in just the last year. It looks overall like the Pacific coast and New England lead in inventiveness, plus Minnesota. The highest-ranked red state is Utah at 13th. It’s a bit surprising to see Hawaii at the bottom of the list, but perhaps it, like Fiji, is too distractingly beautiful to invent much in. Japan and Korea dominate. I’ve never been to Korea, but I can say that whenever you visit Japan it’s clear that these are a people who delight in skill. 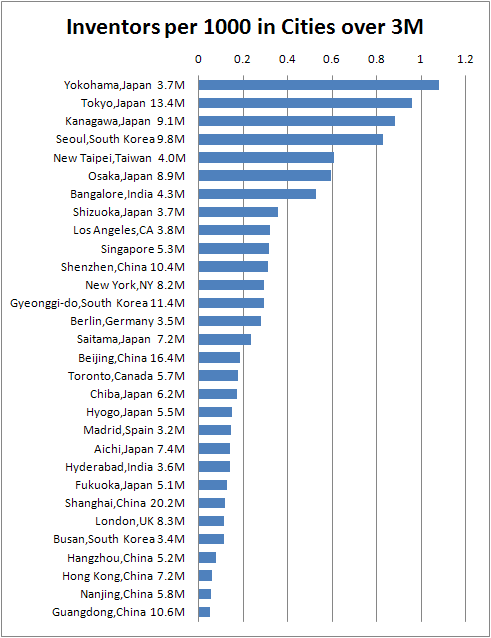 Bangalore, the red-hot heart of Indian tech, is #7, and the first non-Asian city on the list. Los Angeles, New York and Berlin are the large inventive Western cities, and are similar at about 1 inventor per 3000 people. Madrid is unexpected, and a bit ahead of London. Paris actually does very well at 0.6 inventor/1000, but its nominal population is only 2.2M, so it missed the cutoff. The largest city with zero inventors is Aleppo, Syria with 4.4M people. Some other large inventor-less places are Jiddah Saudi Arabia (2.8M), Medellin Columbia (2.4M), and Phnom Penh Cambodia (1.6M). Hsinchu is the richest city in Taiwan, and the home of the chip foundries TSMC and UMC. Note that the scale here is about 10X that of the large cities. Hsinchu has about 4000 inventors – as many as Yokohama even though it’s 10X smaller. After it come San Jose and San Francisco, the south and north anchors of Silicon Valley. Seattle, Austin and San Diego have their charms for coffee, music, and surfing. Dixie is represented by Raleigh at #13, the anchor of North Carolina’s Research Triangle, a quite deliberate piece of government interference in the economy. The largest US city with no inventors is Paterson, NJ, a decayed industrial town near NYC of about 150K. The scale expands by another factor of 3X. About 1 in 30 people in Redmond and Palo Alto was an inventor in 2014; that’s more than one per block. 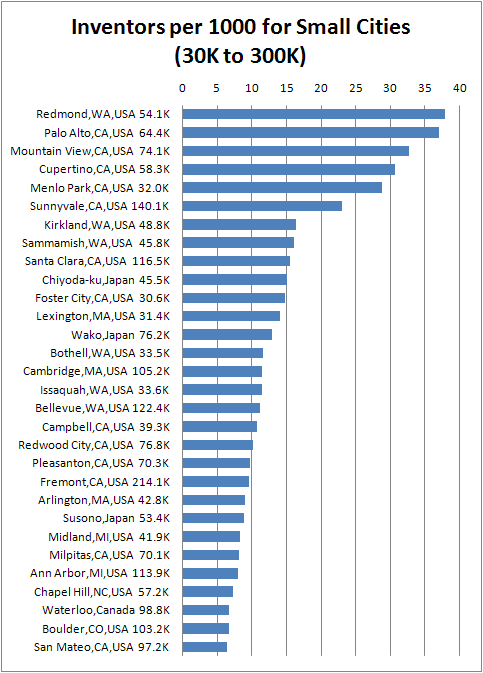 The top spots are dominated by Silicon Valley, and a similar concentration around Microsoft in Redmond. 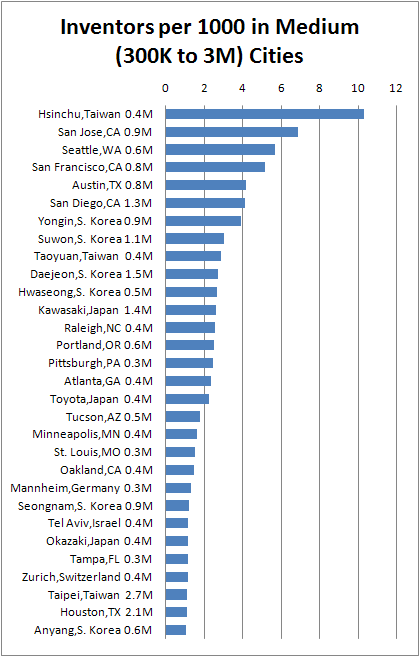 The highest eastern city is Lexington,MA at #12 at about 14 inventors / 1000. It has a reputation as a high-end WASP suburb of Boston, but in looking at the names there I see a huge range of ethnicities. It’s like the upper West Side of the Boston area. I was pleased to see my own town, Arlington, MA as #21 in the world at about 9 / 1000. Sadly, I did not myself contribute to the total in 2014, but I have in the past. What conclusion can we draw from all this? It’s impressive to see the range of places that inventions come from. It’s most places in the world, aside from the dead poorest and the war-torn. There’s a huge range in inventor density between Redmond and Aleppo, but in the developed world there’s an inventor for every couple of thousand people. You may well have walked past one today. Half a million people all over the world came up with something new in just the last year. No wonder no one can keep up with modern life. This entry was posted in Uncategorized and tagged inventing. Bookmark the permalink. 3 Responses to What Are the Most Inventive Countries, States, and Cities? 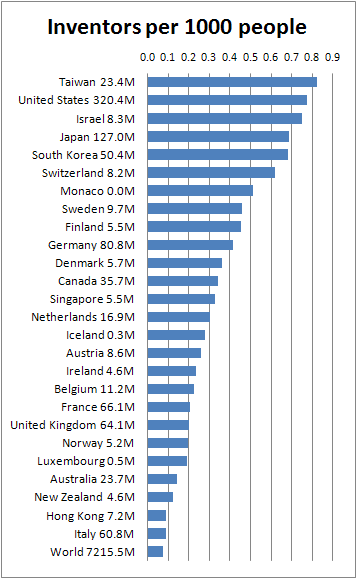 Israel is the 3rd most inventive country per capita in the world, right behind the US & Taiwan. They were ranked #1 four years ago and had nearly 17,000 patents filed.